To all of you who have twin siblings, you and I both understand deeply the concept of sibling rivalry. As an identical twin, my early life was a constant comparison. I loved (and still love!) my twin sister dearly, but I always felt self-conscious. I was never “as good” at things, even though I was the older twin, by eleven whole minutes! When we were little, my “younger” sister loved pink and all the princesses in every story. However, I decided I was the queen. Why settle for princess when I could control everything (including the princess)? This seemed like a no-brainer to me! The only problem was that the queen in almost every fairy tale is a villain…so my parents were slightly disturbed when I asked if I could be Maleficent for Halloween. But alas, I had to settle for being an octopus, which no where near resembled my second favorite queen, Ursula. Eventually, I realized that the possibility of actually becoming a queen was unlikely! But more importantly, the Lord has personally shown me in adulthood that the less control I have over my life and that of others, the more room He has to work, and the more He can reign in my heart. So, as a former Queen-wannabe, I am preparing myself for the courts of the Kingdom of Heaven, where we are promised to be co-heirs with Christ. 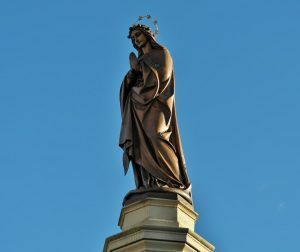 Another lesson the Lord has taught me in my journey of Faith is that in addition to having a relationship with the King, I am also meant to have a relationship with the Queen of Heaven – Our Lady. She, however, is very unlike those I wished to emulate as a young child. First of all, she had no power over any earthly territory, not even her very womb, which she surrendered to the care of her Heavenly Father. 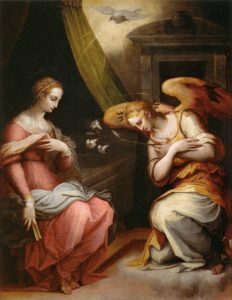 Secondly, unlike fairy tale queens who succumb to jealousy and fear over losing their identity as the greatest or most fair, Mary at the Annunciation trusts the Lord when presented with the news that she could be both Virgin and Mother. And not only that but the Mother of God! And lastly, through her faith and hope, she was able to reveal to others how to live and love in total service of God and those around her. Simply put, she knew who she was before God, and that was always enough, despite her material poverty, poverty of will, and the difficult circumstances she faced as a young mother who was not yet married. Her radical trust in God’s Providence and timing in all things was fuelled by the understanding of her identity and knowledge of her belonging to God. And consequently this fuelled her love of others, as she knew more than anyone the Love of God for their souls. Even though we might know all of this intellectually, we can still feel ourselves distant from her because she is so holy, perfect, and immaculate, and we believe we do not possess any of the same graces. It is as though we see ourselves as a peasant in rags outside of the royal castle. However, her perfection opens the drawbridge for us. Her power was in her Assent to the Will of God, and the constant Fiat she lived in every action, word, and deed, was all for our salvation, that we may be one with her Son and the whole Community of Heaven. Thus, her seemingly untouchable holiness only brings us closer to her and the Blessed Trinity. She sees us approaching from afar and summons the guards to open the gates to us! Similarly, her call to holiness was not only for her, the Queen of Heaven, the Queen of Angels and of Men, it is for all of us- all angels and men! We are asked to participate with her in the same spirit that she was given, the spirit that dwells in each of our hearts. So I hate to break it to you, but no, we are not the fairest of them all. But are we searching for this perfection from mirrors, accolades, and the visible “successes” of our life conquests? Not to fear, because we can safely say that Our Lady truly is the fairest one of all! And praise God that we have so great a Mother to intercede for us at the Throne of the Most High God. 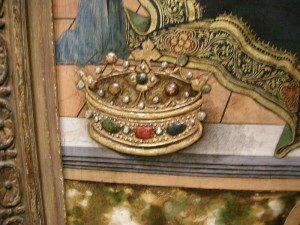 The Queen of Heaven who watches over us, Sons and Daughters of the King. Misericordia works for her home diocese, is a caffeine addict, and loves swimming. Love it! But you will still always be “Queen” to us! Love you so much!…So grateful for my earthly mother and for the talent and sense of humor you bestowed upon me, as your little queen. God bless you for putting up with me all these years…and for actually agreeing to make me an Ursula costume for halloween! Danke schön mein Bruder!!! ?